The effects of Russia's accession to the WTO have been felt differently across various market segments. Experts in the car dealership and meat industry explain their experiences in the new market conditions. Russia’s accession to the World Trade Organization (WTO), when it finally came in August 2012 after almost two decades of fraught negotiations, provoked fears among those operating in the country’s more vulnerable industries. Would we be swamped by foreign products? Would domestic producers survive? Concern certainly ran high in my own area, the Russian meat industry. Now, on Russia’s second anniversary as a WTO member, we can take a sober look at whether those fears were justified. Can the US, EU be sued for sanctions in WTO? As a whole, from the perspective of the Russian meat industry, it does appear we joined the WTO on balanced terms. The quota system was preserved for chicken, which protects domestic production. Russia managed to achieve robust import substitution in this area, and today the poultry market is faring well. The situation turned out to be more complicated for pork. Although WTO membership did lead to an increase in imports due to veterinary restrictions, the cancellation of the import duty on live hogs caused many operators to curtail investment due to fears of a drop in prices. Russia needs to import about a million tons of pork a year to cover the needs of the market. Operators are not yet willing to invest in pork production because the market is too volatile. Today, amid market scarcity, the price is high. But both for us and for producers, not only is the current price level important, but so is long-term stability and predictability, which allow investors to calculate the return on their investments. 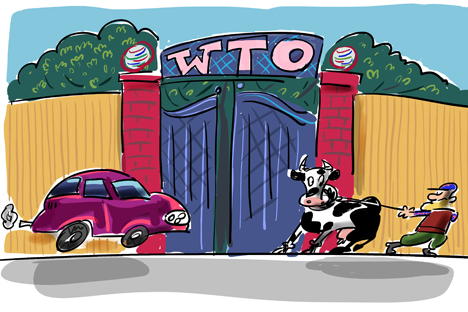 Joining to the WTO, of course, does not mean Russia must refrain from taking steps to support its economy. In my view, serious prospects will open up should we take advantage of “green box” measures. The term is WTO jargon for certain types of programs that support a member state’s economy and are permissible under WTO rules. In contrast with customs tariff regulation, there are no restrictions on the “green box” measures. This primarily means stimulating consumer demand, which is now declining significantly due to the economic slowdown. Developed countries have programs to support socially vulnerable consumers (for example, food stamps in the U.S.). A similar program would help negate the impact of rising food prices due to the import embargo. The investment appeal of livestock production would rise. Such measures, compatible with the WTO, can create new growth opportunities for the entire country. The two years since Russia joined the World Trade Organization have brought a number of benefits, due to the expansion of free trade. Indeed, one need look no further than Russia’s auto market to see a case in point. Of course, car dealerships in Russia began consolidating in the early 2000s, before Russia’s WTO membership. Foreign automakers had brought modern business processes, training programs, recruitment methods and certification, logistics and sales systems to Russia. This facilitated the creation of an advanced niche in the Russian economy. Since then, some €12-13 billion has been invested in dealership enterprises built by private investors in Russia. By the time Russia joined the WTO, car dealerships were springing up like mushrooms in Russia and foreign vehicles were extremely popular. None the less, Russia’s participation in the WTO served as a major step toward integration into the world business community. Lower import duties on automobiles opened doors for everyone involved: importers, dealers and consumers. Lower prices had a positive impact on sales. The market expanded year-on-year in 2012, and its decline in 2013 would have been much more dramatic had there been no customs duties. Even the Russian government’s protectionist measures – levying a recycling fee on importers on account of reduced import duties – had an entirely beneficial effect on the market. This made it possible for Russia to establish a business associated with vehicle recycling, which, in turn, stimulated demand. Russians started to get rid of their old cars and buy new ones. On the one hand, of course, automakers were the losers in that they had to pay a recycling fee. But on the other hand, the recycling fee created additional preconditions for buying a car. In other words, had there been no recycling fee, new car sales may have been lower. WTO accession not only spurred demand in the Russian auto market, but also helped establish an auto recycling process. Overall, more openness has been a positive. Vladimir Mozhenkov, vice president of the AvtoSpetsTsentr Group.